Here in today’s bike pic we dig back to a previous RAGBRAi and show this biker dude cooling off, under a spray nozzle, as he entered one of the communities along the route. What a fun way to bike across Iowa! What better way to plan your upcoming riding season fun and #NextBikeAdventure in 2018. View all the great ideas and bike destinations in the latest Have Fun Bike Guide. Then plan your next outing with family and friends in one of our HaveFunBiking Destinations. 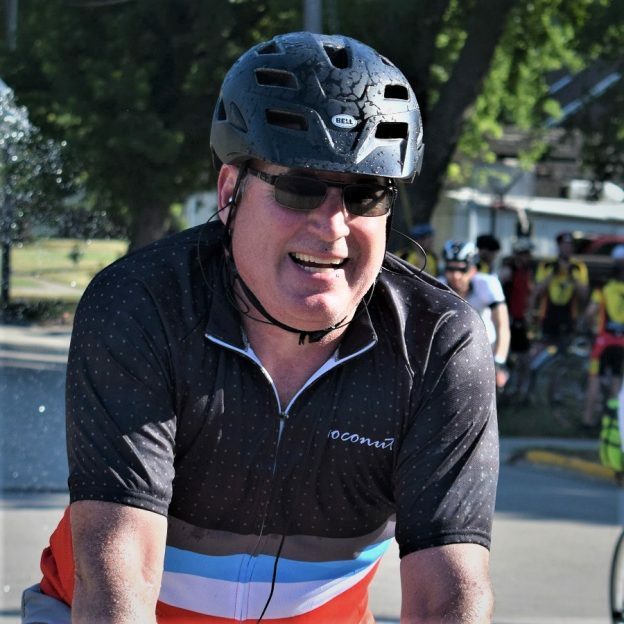 This entry was posted in Picture of the Day and tagged bicycle pic, bike commute, Bike Iowa, bike picture, bike tour, bike touring, bike tourism, biker dude, fun bike picture, pictureperfect, RAGBRAI, ride across Iowa, riding into the sun, road bike, sun glasses on April 17, 2018 by Russ Lowthian.